OK, so coffee isn't food, but you know what I mean. I think there is nothing that defines a day in Vietnam more than the consumption of lots of glasses of cafe sua da. This is strong coffee drip-filtered over ice and then stirred into a healthy dollop of condensed milk. It is truly delicious, and a real heart-starter. As I discuss in my book Destination Saigon, cafe sua da is not really considered the most macho way to take one's coffee. 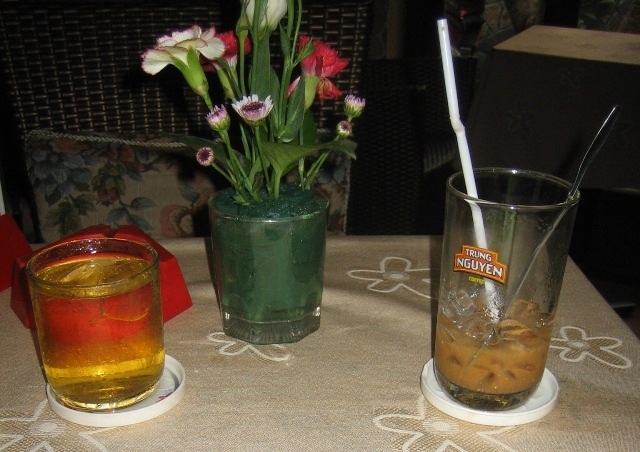 In Vietnam, real men take their coffee black over ice, with a healthy spoon or two of sugar added. Indeed, as you travel further North coffee with ice seems to become more and more effeminate. My friends in Hue forbade me to drink it, and when I ordered it in a rough Hanoi cafe the waiting staff cast aspersions on my sexuality. But say what you like, I'm sticking to cafe sua da. Something about the combination of lots of caffeine and the incredible sugar rush of condensed milk does something for the soul, particularly on a hot day.